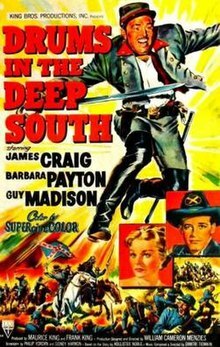 Drums in the Deep South is an American Civil War war film designed and directed by William Cameron Menzies who was production designer of David O. Selznick's Gone With the Wind (1939) and also designed the cave sequences in Selznick's The Adventures of Tom Sawyer (1938). Based on a story by Civil War author Hollister Noble, the film was produced by an independent company King Brothers Productions, filmed in SuperCineColor and released by RKO Pictures in September 1951. B. Reeves Eason directed the second unit. Best friends Clay Clayburn (James Craig) and Will Denning (Guy Madison) graduate from West Point and visit their friend and fellow graduate Braxton at his Georgia plantation in 1861. Clay had once loved Braxton's wife Kathy (Barbara Payton) and still does. When war is declared they soon find themselves fighting on opposite sides of the Civil War. By 1864, Clay now a Field Artillery Major in the Confederacy is renowned for accepting but surviving suicide missions. He is given another. To delay General Sherman's March to the Sea, a local guide can lead a party of men and their disassembled cannon inside caves that lead to the top of Devil's Mountain where a battery of guns can destroy the railroad and the Union troop and supply trains that travel it, buying time for the Confederacy. Devil's Mountain is coincidentally near Braxton (who is now fighting elsewhere for the Confederacy) and Kathy's old plantation where Kathy remains with her uncle. Kathy agrees to monitor the activities of the Northern invaders and signal Clay's outpost from her window through a mirror by day and a lantern by night. Through her activities, Clay's men are notified of the arrival two supply trains and destroy both of them. Arriving at the plantation is Will, who is now a Major in the Union Field Artillery. When the two men meet each other in combat, neither knows it as each is in an artillery position hundreds of yards from the other. However, the love of Clay's life, Kathy Summers, does know and tries desperately to save her two good friends from killing each other. The Union Field Artillery cannot achieve the elevation or range with their cannon to clear the Confederate guns at the top of the mountain. Inside the mountain, the Union Infantry cannot find the path to the top and are delayed by Confederate snipers. As the railroad line has been blocked by two destroyed trains, Union headquarters send a giant Naval Dahlgren gun manned by sailors and mounted on a flat car that has the capability to wipe out the Confederates. Kathy is able to supply Clay's guns with wire from her piano that is used to reinforce the barrel of one of Clay's guns that with a double charge and maximum elevation is able to destroy the naval gun and further block the railroad line. Will has Union Army Engineers mine the inside of the mountain with explosives that will literally blow the top of the mountain. Kathy wishes to act as a mediator to get Clay and his men to surrender that the Union army is keen on as it will save time. However, Clay calculates that the explosion will send the cliff down over the railway line further blocking the Union's supplies. Drums in the Deep South was the first from a new production set up by the King Brothers which involved them raising finance by selling shares. 300,000 shares worth $300,000 were issued to over 700 investors for Drums. The film was shot at Sam Goldwyn Studios and on location at Sonora, California. The King Brothers sold Drums in the Deep South to RKO, who distributed the film. Drums in the Deep South was profitable and King Brothers announced plans to reunite Craig, Madison and Payton in a follow up film called Murder March about the March to the Sea but it never went into production. Reviewer Jim Craddock in a later review, noted the plot in Drums in the Deep South was "... hampered by a familiar premise". The King Brothers later sued RKO for mismanaging the distribution and sale of the film, claiming $10,000 in damages. ^ "Detail View: 'Drums in the Deep South'." American Film Institute. Retrieved: May 19, 2014. ^ a b Brady, Thomas. "Hollywood agenda: Capra and Stevens will leave Paramount In production policy change; Addenda poor starts turning point stock dealings more color." The New York Times, April 8, 1951, p. 101. ^ Scheuer, Philip K. "Tim Holt leatherneck; Directors pick Huston; King Bros. celebrating." Los Angeles Times, September 5, 1950. ^ Schallert, Edwin. "McCarey's 'Born in Trunk' activated; Nancy Davis likely as Tracy wife." Los Angeles Times, September 20, 1950, p. B11. ^ "Movieland briefs." Los Angeles Times, October 23, 1951, p. B7. ^ Craddock 2000, p. 300. ^ Pryor, Thomas M. "Film group files suit of $6,030,000: King Brothers alleges trust violations in 3 releases." The New York Times, November 5, 1958, p. 43. Craddock, Jim, ed. Video Hounds Golden Movie Retriever 2001. New York: Gale Group, 2000. ISBN 978-1-5785-9120-6. This page was last edited on 14 January 2018, at 01:17 (UTC).